There are more than 80,000 Saltwater Crocodiles roaming the Northern Australia waterways, but they are rarely ever seen. The crocodile is a cold blooded animal, in the cooler months of June, July and August you can see them basking in the sun. In the warmer months crocodiles bury themselves in the mud or hide under the shade of a tree. The crocodiles know the boats, they leave their place of hiding, knowing they may be fed. This happens all year round!! 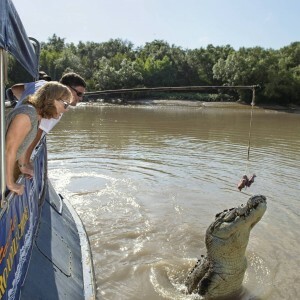 Located about 65 klms east of Darwin on the Adelaide River, the Jumping Crocodile Tour has been in operation since 1985. 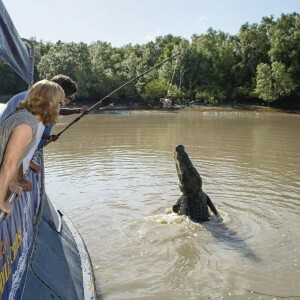 An ex-crocodile hunter who wanted to find a way to continue to make a living from his beloved crocodiles began the tour. 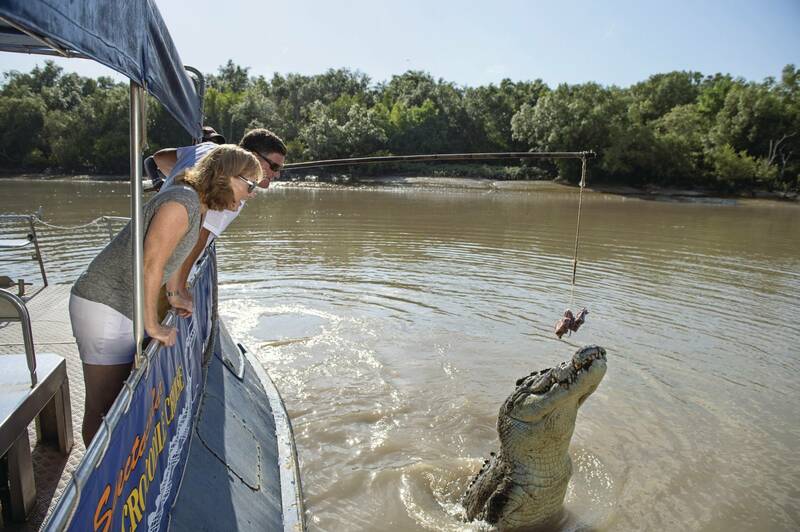 The international success of Paul Hogan and the Crocodile Dundee movies at about the same time ensured the success of the venture, and today the Jumping Crocodile Cruise is one of the most popular tour destinations in the Northern Territory. 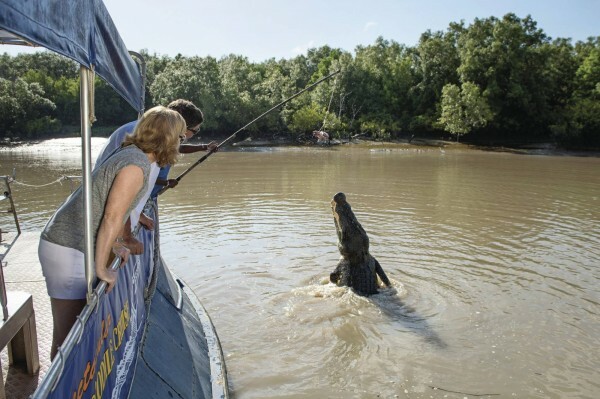 Crocodiles along the tour route have learned to jump out of the water to snag small pieces of meat dangled from lines, offering a up-close view of these aggressive reptiles in the wild. The experienced crew will make sure you are equipped with the knowledge you need to ensure you remain safe at all times. 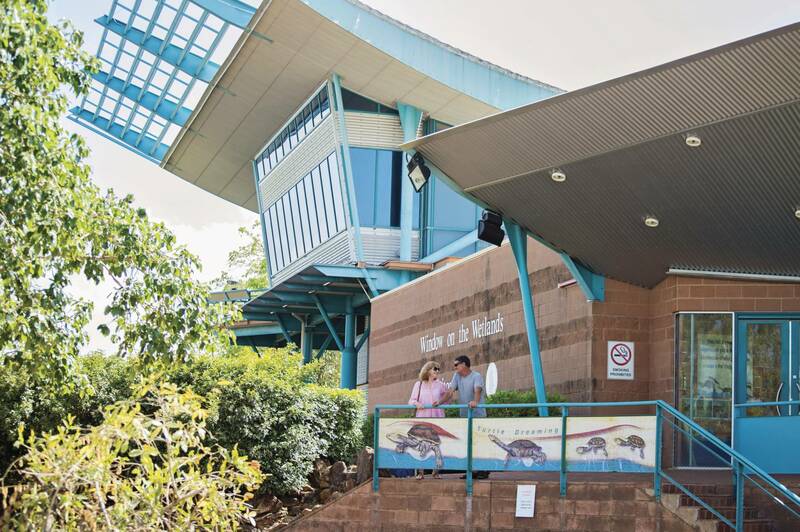 Turn Left at Windows on the Wetlands Visitor Centre and give yourself some time to visit this great information centre. 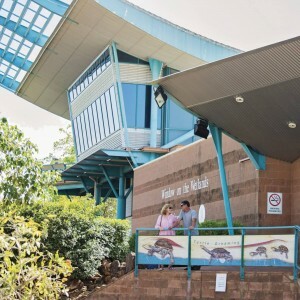 Situated on the Arnhem Highway on the way to Kakadu National Park. Infants accompanied and supervised by an adult free.